The Marple Website's twelfth year on-line saw some changes. They began with the folding of Marple Promotions and the end of Peter Clarke's involvement in the web site after we agreed to pursue our interests independently. So I'd like to start this year's Christmas and New Year greeting by thanking Peter for the contributions he made to the web site's success. 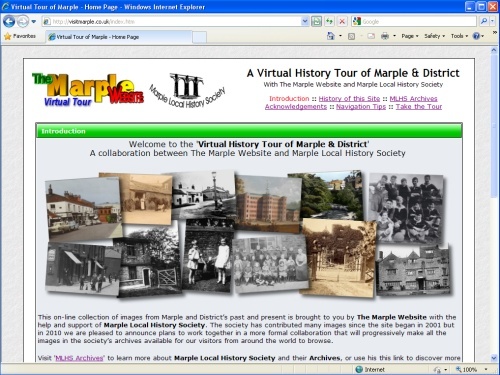 One of the most exciting new developments in 2010 happened in March, when Marple Local History Society agreed to share their archives with the community through the Virtual History Tour of Marple. Since then 780 images from the society's archives have been uploaded with plenty more still to come. As I write this the Virtual Tour now features a total of 5,072 images that have been viewed an amazing 895,493 times. That's 1,500 new photos added and 252,000 images viewed since Christmas Eve last year. At this rate 2011 will see the magical milestone of 1,000,000 images viewed sometime around the middle of the year. Marple Local History Society's increased involvement in the site has also led to several new History and Heritage articles being contributed by others. These included Memories of Marple Children's Orthopaedic Hospital by Ken Chaisty and Francis Brindley and the Brindleys of Marple by Noel Brindley. I'd like to thank Ken and Noel for these welcome additions and urge anyone with interesting local history stories to share to please get in touch. In addition to the expanding collection of historic photographs on the Virtual Tour, this year it has increasingly become a medium for displaying new images of local events and happenings too. 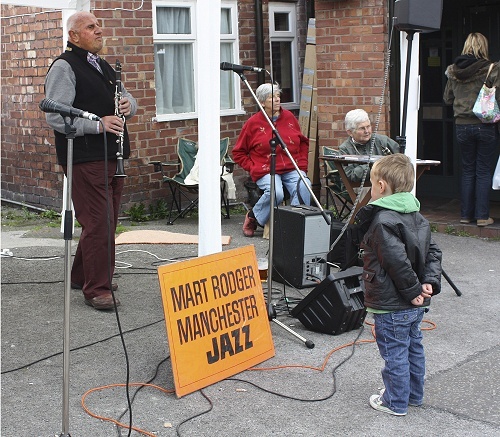 Nowadays if I attend an event in Marple there are often photographs of it in my mailbox before I get home, which is brilliant! The success of this aspect is largely down to one man who's made a fantastic contribution to the web site this year; professional photographer Arthur Procter. 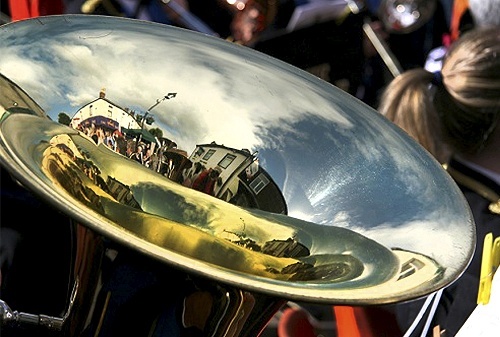 Arthur has sent in photos for use on the site for several years but he really came into his own in 2010 when he took on the role of unpaid official photographer for the Marple Festival. How he managed to attend as many events as he did over the festival fortnight I don't know but I could barely keep up with him to get them on-line the next day. So a VERY BIG thank you to Arthur for all his efforts, I know that lots of people have really enjoyed seeing his photos appear on-line. Others who have made a great contribution too include David Burridge, Gavin Eyquem, Ruth Hargreaves, Ray Noble, Svetlana Roberts and Terry Wood. Thanks to you all and please keep them coming in 2011. Special thanks are also due to Ray Noble for his contributions to the vintage photos and captions on the Virtual Tour and his detective work on the mystery photos. Congratulations to the Festival Committee for coordinating such a fantastic series of events. Arthur also recently contributed to the History and Heritage section of the site by recording a local lady in her 90s talking about her memories of Marple that was added to the site in December. We'd like to do more of this if possible and an interesting development has arisen as a result of this first "audio article". I hope to reveal more early in the New Year! In January links with Marple Pennsylvania USA were reestablished and I also managed to negotiate permission from the Art Institute of Chicago to display coloured images of their tapestries that once hung in Marple Hall. I'd been waiting patiently since 2006 only to discover that it was going to cost £385! Thankfully the Institute eventually agreed to waive the fees and I'd like to record my appreciation to them for changing their minds. 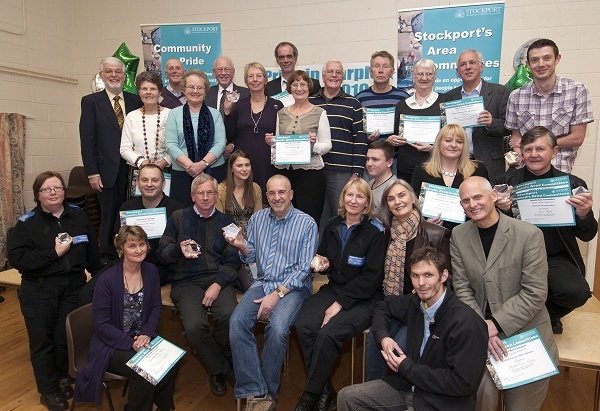 2010 saw increasing collaboration with Marple Civic Society, a group that has been revitalised in the last few years. In March their new Design Awards scheme was announced and at present you can vote for your favourites in three categories; Buildings, Urban Landscape and Public Art in a variety of ways, including in the Forum and Noticeboard. There will be an exhibition of all the nominations in Marple Library between 14th and 21st January 2011 and, being totally partisan, I hope you will all vote for Memorial Park and "Midnight" the Tree Sculpture! 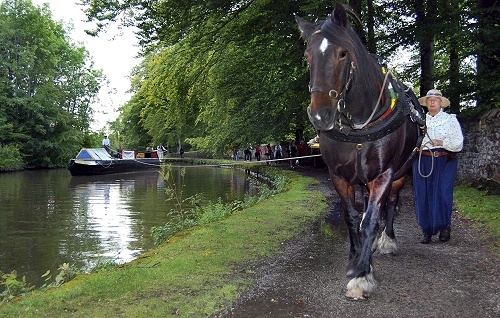 In July the Civic Society also published their "Vision for Marple"; an exciting and adventurous collection of ideas put together with the help of many local groups and societies. I was pleased to contribute some suggestions and to publicise it on-line. I hope it's something we'll hear more about during 2011. Another group that has been revitalised in 2010 is Marple Carnival Committee. This time last year there were fears that Marple's tradition of carnivals would end with the retirement, after 20 years service, of Chairman Bill Ardern. Thankfully following a good response to appeals for more volunteers the committee now has fresh blood and a new leader in Chairman John Wright. The 2010 Carnival turned out to be a great send-off for Bill and a record fund-raiser. Hopefully John and the Carnival Committee will be able to nurture and build on Bill's legacy and keep us all entertained on the third Saturday in June for at least another 20 years! An important area of the The Marple Website is the Community Pages, which enables local groups, with or without their own web sites, to promote themselves. This year new members to "sign up" are Marple T'ai Chi, Marple Moments, Millbrow FC and Friends of Rose Hill Station. When kept up-to-date the Community Pages also provide fresh content to keep visitors coming back, so it works well for everyone. I'd particularly like to thank Marple Writers' Workshop, who this year started to publish their poems and short stories on the site; the Society of Marple Artists, Marple Rambling Club, Goyt Valley Rail Users, Marple Arts Group, Marple Philatelic Society, Marple 10k Trail Run Organisers and New Mills, Marple and District Rotary Club who all kept their pages up to date and current. Thanks also to the organisers of The Marple Writing Competition, which is an event that The Marple Website has helped to promote for the third year running - the competition has gone from strength to strength and is now receiving entries from all around the world. New groups like these are always welcome to join the Community Pages and all you have to do is provide some words and pictures to get started - it couldn't be easier! Following the creation of an addendum to the late Gordon's Mills' Walking Guides in 2009, another part of the web site updated in partnership with Marple Local History Society in 2010 was Gordon's Walk Number 2 - The Roman Bridge and Lakes. We produced a new down-loadable pdf of this walk plus a special on-line version with old and new photographs. My thanks to David Burridge for his help with this and although this task is proceeding more slowly than we expected the intention is to continue giving the other walks the same treatment in the New Year. The highlight of the year for me has to be having my efforts on The Marple Website acknowledged with the award for Volunteer of 2010 in the new "Pride of Marple Awards". As a friend of mine pointed out, I'll always be the first to win this no matter how many years the awards run for and how big they become! It was good that the Friends of Marple Memorial Park received an award too and I've asked the organisers to allow me to put the nomination forms on the web site next year so that they are more widely publicised. 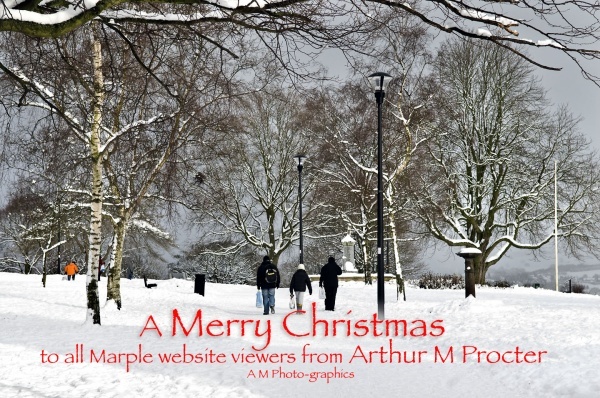 The Marple Website is all about the local community making contributions and keeping the site fresh, active and alive. There are many ways that people can do this, including registering in the forum and posting your two-penneth in the variety of topics discussed there, or publicising your organisation's activities in the Events Calendar. A great example of how anyone can contribute is this festive poem sent in by Brabyns Preparatory School just yesterday, which gives me a great way to end this year's greeting - so thank you Year 6 and Merry Christmas! Soporific Santa’s resting with sherry filled pride.